In 2013, growth trumps all other considerations. For the average 2013 venture backed tech IPO, half of the startup’s enterprise value is explained by its growth rate, while none of it is explained by profitability. The market has spoken and startups have responded. Of the 25 IPOs I surveyed, both pending and completed, only 20% are profitable. On average, these startups operate at about -20% net income margins but are growing at 162% annually. The startup financing market is (mostly) a trickle down market. The public markets benchmark the value of different companies, growth trajectories and financial characteristics daily. These data are used to price comparable companies in the private markets particularly by growth investors but increasingly by earlier investors. SaaS startups prove the point. Their older brothers have become darlings in the public markets, and as a result, early stage SaaS valuations have appreciated quite rapidly in the venture and growth stage markets. The opposite is true for gaming startups, caused by Zynga’s tumultuous ride on the Nasdaq. Let’s go to the data to prove the point. Below is a chart with 21 different 2013 IPOs. 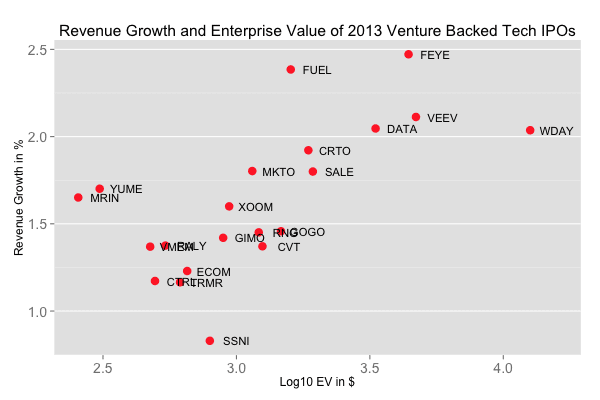 The y-axis shows 2012 revenue growth and the x-axis shows the enterprise value of the business (log10). Each company is represented by a dot and the ticker is labeled. It’s easy to draw a straight line up and to the right. The correlation between these two is 0.51, quite strong. This means growth is the single most important correlating factor when predicting enterprise value. Next, is the same chart for net income and enterprise value. It’s a mess compared to the one above. There is no relationship between profitability and the startup’s enterprise value. 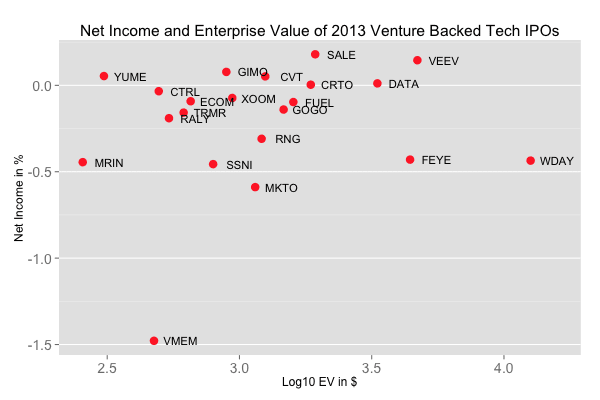 The correlation between net income and enterprise value is zero. Notice Control4 and Violin memory have the same market cap, but one is break-even and the other lost $120M on revenues of $90M. That means the company’s gross burn is $210M annually! I suspect tech IPOs are one of the very few high growth investments afforded to investors. Because there aren’t many alternatives for these investment dollars that can generate meaningful returns, startups who are going public command pricing premiums even without the discipline of profitable growth. Today, that trend is trickling down to the early stage venture market and reinforced what has always been true in early stage startup investing: growth is king.